Pictured, from left: Chris Tutin; Coun Steve Scotthorne, Coun June Evans and Coun David Challinor, ward members for Harworth, and Kenay Reshad, Technical and Design Manager, Bassetlaw District Council. Children in Harworth and Bircotes have a brand new play area to visit following the completion of a council housing development. Over the last three years, a partnership between Bassetlaw District Council and Woodhead Group has created a total of 83 new homes that include a mix of modern and energy efficient flats; two, three and four bedroomed houses and bungalows, in addition to a new playground on Amanda Road. 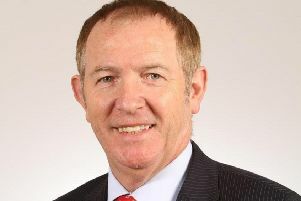 Coun Steve Scotthorne, cabinet member for housing, said: “When this project was proposed it used a former playing field to provide space for much needed additional housing. The enclosed play area features four pieces of equipment in addition to rubber Wetpour flooring. The surrounding area has been landscaped and incorporates four different species of trees and sound-proof fencing. Chris Tutin, Head of Commercial at Woodhead Group, said: “The completion of the play equipment is the final part of a very successful three-year programme to build 83 new high quality homes for Bassetlaw District Council.